The "ozero Baikal" is the most famous place in the vastness of Siberia. The subject of poets, artists and musicians, its extraordinary natural endowment also makes it a place of vital importance for humanity, for its depths hold a fifth of the world's fresh water supply. It is unfortunately also an area of increasing unrest, owing to the terrible destruction brought by heavy industry in recent times. The geological origins of the lake go back some 500 million years. 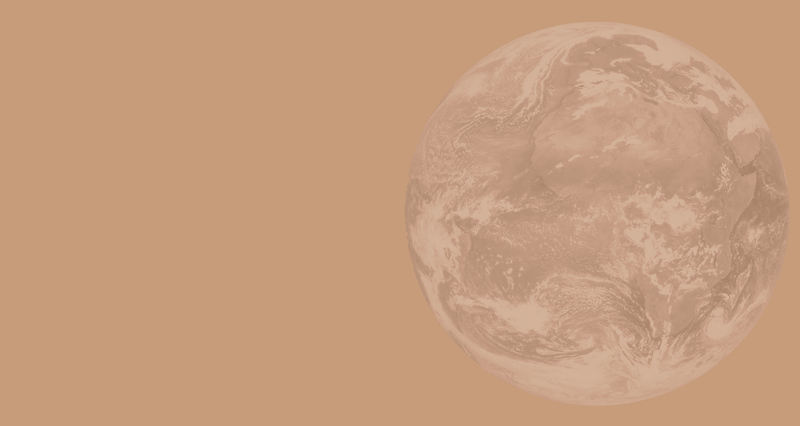 Born from intense seismic-volcanic action, its connection with the restless and unknown interior of the Earth seems to remain alive. Cracks in the earth's crust pour out streams of boiling mineral water. Light tremors and, at times, violent earthquakes reshape the surface of its craggy slopes, extinct volcanoes and mountains covered by the Taiga. Twenty seven islands emerge from its waters, the number of which, coincidentally, is also the number of the islands making up the Cocos archipelago. Oljon, the largest of them, is an island sacred to Siberian shamanism and Mahayana Buddhism. Its vegetation and fauna are remarkably abundant. The lake has been found to have more than a thousand species that are exclusive to it. Sponges and algae, mollusks, salmon and sturgeon live there, together with a strange creature, the Comephorus baikalensis, a transparent viviparous fish that lives in its depths. But the most famous of these exclusive species, and its most advanced predator, is the Baikal seal, the only freshwater seal in the world, whose arrival must have occurred by chance during the prehistoric thawing of the rivers of the North. The beauty of the lake is exquisite, incomparable. The harshness of the seasons completely renews its landscape. All is still and dormant during the winter. The north winds carve deep hollows into the ice, where the seals live. But in the warm season, the birds return, life is clothed once again in green, and colors explode into the long days of summer. All of the east coast of Baikal and a great part of its remaining area belongs to the Autonomous Republic of Buryatia, occupied by Russia since 1689. The territory of Buryatia covered 350,000 square kilometers and is make up of altiplanos, mountain ranges and valleys almost completely covered by the Taiga, the world's largest forest. The area not covered by the waters of the lake is carpeted by Siberian larches, firs and birch undergrowth. Thousands of birds live in their branches, with the grouse or the elegant swan reigning supreme. The elk, the sable and the lynx are just some of the species that roam this land. The sparse presence of human beings, in addition, means that the immemorial purity of the Taiga has remained almost untouched. The population of the Republic is around 1 million people The majority of them live in industrial or mining regions. Ulan-Ude, capital of Buryatia, is the one of the most important connection points in the Transiberian railway. Kiatja, a city on the border with Mongolia, has been a key meeting point for cultures and trade between Orient and Occident. Buryats, the original inhabitants of these lands, are presently about a third of the total population. Like the other Mongol peoples, they are courageous in battle and love hunting and horses. Their feudal customs have undergone inevitable changes in this century. But their tradition is still alive in the shelter of the huge mountain ranges, such as Barguzin Krebet, the probable point for the emergence of the Asian Vertex of the Soul of the World. The arrival of the Buryats in Transbaikal took place in the 13th century. 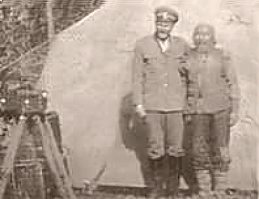 Like the Tungus tribe or the Yakuts, they were nomads who came from the valleys of the Amur River in China. Anthropologists believe that the first colonizers of America also set out from those valleys. From Kamchatka and across the Aleutians, they spread out all across America, creating tribes and cultures all the way to the southern limits of the continent. 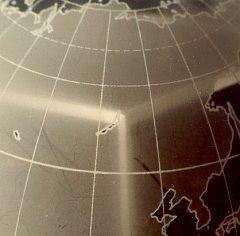 It is not too far-fetched to think that the distant origin of the Buryats may be the same as that of the people of its antipode, Tierra del Fuego, the Yaghans or Fuegians. The traditional religion of the Buryats is shamanism. Their integration with Nature and their pantheistic animism are magnificently shown in the unforgettable movie Dersu Usala. The 17th century saw the arrival of the first Orthodox missions from Russia and the first Buddhist monks from Mongolia. 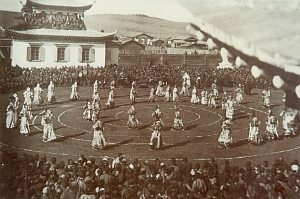 The monks, followers of the Tibetan tradition, adapted rapidly and integrated much of the Buryat pantheon into their teaching. The "ongons," the guardians of magical places in Transbaikalia, were taken by the lamas as protectors. In the ritual Tsam dance, which refers to the passing nature of all things, seven circles are drawn to mark the boundaries for the dancers. 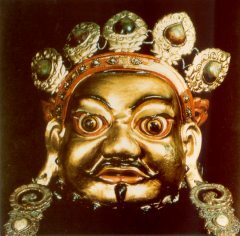 Among the characters in the ritual are the Buryat ongons Zhamsaran, patron of War and Fire, and Namsarai, patron of Wealth and Earth. In the center shared by the seven circles, the offering or Sor is placed upon a table covered with a silk cloth. It forms a small pyramid, its shape representing Fire, which consumes and purifies all on Earth.